We’d love your help. Let us know what’s wrong with this preview of Before Space Recon by M.D. White. Ten years before Commander Grant and his SR-X experimental fighter left the ground, the U.S.C. Defiance became the flashpoint for humanity’s First Contact War. While unprepared for the devastating assault from an alien race that was by all previous accounts peaceful, the crew will need to band together if any are to hav An unwitting sacrifice. A spark to ignite the galaxy. To ask other readers questions about Before Space Recon, please sign up. As the crew of the U.S.C. Defiance – a space ship designed to haul cargo between Earth and Sol Bravo – make their peaceful way to a designated destination, an unknown force disrupts their equipment, throwing the U.S.C. Defiance off-course. Little does the crew know that an Aquillian space ship nearby, feigning assistance to the U.S.C. Defiance, has sparked an ambush against the cargo ship. As the ship’s hull is breached and the body count begins, the crew sends out an S-O-S, while utilizing ever As the crew of the U.S.C. Defiance – a space ship designed to haul cargo between Earth and Sol Bravo – make their peaceful way to a designated destination, an unknown force disrupts their equipment, throwing the U.S.C. Defiance off-course. Little does the crew know that an Aquillian space ship nearby, feigning assistance to the U.S.C. Defiance, has sparked an ambush against the cargo ship. As the ship’s hull is breached and the body count begins, the crew sends out an S-O-S, while utilizing every possible resource they have to survive the attack. The ensuing bloodbath reveals the shocking motive behind the ambush, as the crew does all they can to protect its precious cargo and alert their rescuers to the imminent danger which lies ahead for all mankind. Matthew D. White’s hard-hitting, Sci-Fi thriller, which acts as a prequel to the brutal war between interplanetary species, is filled with suspense and packs a powerful punch with each turn of the page. Every action portrayed in this short story is well-written and quite graphic, painting a clear picture in all respects, whether of the controls and layout of the space craft or the brutal execution of each crew member. While I am not generally a fan of Sci-Fi, I found Mission SRX: Before Space Recon positively riveting in the explosive, non-stop action which takes place between crew members with a seemingly simple job of cargo delivery, and an enemy alien species which will stop at nothing to seize what is on board. The portrayal of ruthless, blood-thirsty killers which ambush those who are trained to protect their cargo and nothing more, is spine-chilling. 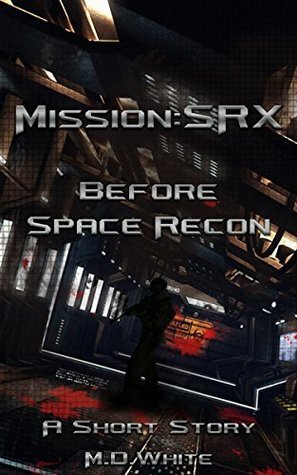 I enjoyed Mission SRX: Before Space Recon and recommend it to Sci-Fi fans who enjoy apocalyptic tales which reveal unsung heroes and true warriors. As humans push out into space, they encounter only one other sentient species residing in a distant star system. The other species remains pretty passive--until they don't. This short tale follows a smattering of bridge officers on an minor transport vessel that gets waylaid by technology that they don't understand. Suspiciously, an Aquillian ship happens to be primed to help them out in the insignificant stretch of space in which they're stalled. Immediate warning bells goes off, when they think As humans push out into space, they encounter only one other sentient species residing in a distant star system. The other species remains pretty passive--until they don't. This short tale follows a smattering of bridge officers on an minor transport vessel that gets waylaid by technology that they don't understand. Suspiciously, an Aquillian ship happens to be primed to help them out in the insignificant stretch of space in which they're stalled. Immediate warning bells goes off, when they think on the cargo of weapons they transport . . .
A paradigm is willfully broken here, when no canny hero of the Defiance rises fantastically above the situation. Sometimes, impossible odds are impossible odds. There's not always a Ripley in the face of an Alien incursion or a John McClane when terrorists create a hostage situation. If The Walking Dead and Game of Thrones have taught anything, it's that just because a character is liked, it doesn't mean they're not expendable. This was a very brief book leaving the reader to want to follow this storyline and follow the continuing adventure. Ih man this story kept me up late more than one night. I found myself not wanting to put this one down. More please ! MissionSRX: Before Space Recon: Book 101 is a galactic empire science fiction novella written by Matthew D. White. Lieutenant Commander Warren Hughes knew his current command assignment was a modest accomplishment, to say the least. The Defiance was no state of the art battleship; rather, it was little more than a glorified cargo tug, a first-generation civilian freighter that had been modified for the military. He was still its captain, however, and there would be plenty of time for him to get those coveted assignments to real battleships or frigates. For now, he would have to be content with the current mission of The Defiance -- delivering supplies to the colonists and outposts scattered throughout the empire. Sol Bravo was the outer reaches of his route; it was the first system discovered to have sentient life. Hughes' vessel had had some limited contact with the Aquillians, but that would soon change, and change dramatically. The Defiance was off-course, and their emergency broadcast would make matters even worse for the captain and his crew. I was looking for a new military space opera type series and I happen to get an email from Mr. White asking if I’d read his short story and maybe that would lead to me reading his follow-on three book series. I usually don’t read short stories, but I took the chance just because I didn’t want to miss something in the start of the series. This short story is pretty concise. An Earth military cargo hauler is in route to a colonized Earth planet. The crew is military in that Earth, but expected this I was looking for a new military space opera type series and I happen to get an email from Mr. White asking if I’d read his short story and maybe that would lead to me reading his follow-on three book series. I usually don’t read short stories, but I took the chance just because I didn’t want to miss something in the start of the series. This short story is pretty concise. An Earth military cargo hauler is in route to a colonized Earth planet. The crew is military in that Earth, but expected this mission to be a “milk-run”. Earth has encountered another spacefaring race called the Aquillians, but so far, they have been pretty docile. The U.S.C. Defiance is using Earth warp drive to conduct it’s mission. The drive is the first invented by humans and it doesn’t work all that well, in that the longer the jump, the more of an error in destination is created. So, they have to make rather small jumps, re-caclulate their location, and jump again. Their last jump put them in a strange part of empty space where their navigation went haywire. They didn’t know where they were and were attempting to try and figure that problem out when they spied an Aquillian vessel not far from them. What happens next will make your blood boil. I immediately volunteered for the United Space Corps. The Aquillians apparently want a war, and we’re going to bring it to them. "Remember the Defiance!" This is a prequel to Commander Grant and his SR-X Fighter, which I assume is the thrust of the series by White. Although short, it is an entertaining story and fits lock-step with Sci-Fi, Space Opera, Military v Aliens themes. I enjoyed the read and would consider starting the series. White wasn’t afraid to kill off characters – and if he is that liberal in the actual series - it would make for a fun ride. Expect some quick action and character introductions. This story is supposed to take place This is a prequel to Commander Grant and his SR-X Fighter, which I assume is the thrust of the series by White. Although short, it is an entertaining story and fits lock-step with Sci-Fi, Space Opera, Military v Aliens themes. I enjoyed the read and would consider starting the series. White wasn’t afraid to kill off characters – and if he is that liberal in the actual series - it would make for a fun ride. Expect some quick action and character introductions. This story is supposed to take place a decade before the series launch and I’m not sure if this material is found in flashbacks or not. It does launch the “First Contact War,” which must be a catalyst to the adventures among the stars.